I did get a lot done on Friday Night (well, we know how my Friday nights extend into Saturday and Sunday! )……I’m sorry I didn’t post before now….but I was finishing off a new design and writing the pattern…..so at 1am this morning, I was packing it away into a postpak ready for sending to a magazine for inclusion later in the year. I even managed to consume a ‘small’ bowl of these delights…. with a warm cocoa, of course…..you can never have too much chocolate! We had stitchy people all over the globe altogether on Friday night stitching away, and from those, Mr RNG decided he’d draw number…. as the winner of this lovely sewing tool keeper kit…. So a BIG CONGRATULATIONS TO MELODY in Melbourne who just happened to be making lots of hexies on Friday night like me! 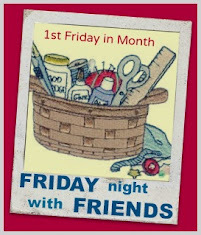 I wonder how many more of us have caught the hexi bug on Friday night? Congratulations to Melody. A great win for her to enjoy. I am so excited that I am the winner. Lucky lucky me. Many thanks to you Wendy. Thank you for hosting FNSI. I always have a great time sewing and seeing what everyone is up to! Yay for Melody! A lovely gift for a lovely lady. Hmmm a hexie mystery awaits. Very interesting. Sneakies can be a word if you want it to be :) Congratulations Melody.